an eventful weekend.. - A mummy's inane blabberings..
Had originally planned to bring Aidan to Snow City during the weekend but no one else was keen [especially ahbang *bleah*] :( So back to ECP we went..
That Sunday was quite memorable because of something that happened that evening. We'd arranged to meet with Pei Fen after our dinner at ECP as she was interested in viewing our apartment..and so the plan was for her to follow our car back to Hougang. When we reached the exit of the carpark, we saw Pei Fen's car behind this Merc and we could see her boyfriend Ed and the owner of the Merc Benz engaging in what seemed like a heated verbal argument. First thing that came to our minds was that she'd gotten into an accident with the Benz.. Hubby and I quickly went to see what had happened and realised that it wasn't so.. Apparently, Pei Fern was driving off at the carpark gantry but because she was a li' slow in doing so, and the Benz dude started honking at her car repeatedly (more than 7 times) which made Ed, her boyfriend pissed. Not exactly sure what Ed did (I think he merely muttered something at the driver when he drove by) but the Benz dude became enraged as a result. He stopped his Benz right infront of Pei Fern's car and got out to confront Ed. He was ranting on about Ed, saying that he had no right to react that way since he wasn't the driver. Ed was quite calm initially and tried to reason with him but the Benz guy simply couldn't be appeased and became more and more abusive and started hurling vulgarities. Ed told him.."Fine, if you aren't happy, go call the police and let them settle the problem". We'd thought that things seem to have been settled when the Benz dude started walking back to his car (though he was muttering "you think I don't dare to call police!" repeatedly). But boy were we mistaken.. he rushed back out with a long metal rod and began to swing it about in a threatening & dangerous manner. On seeing this, hubby quickly blocked his path and said to him in a soft but stern voice "If you hit him, you'll be going to jail! "..He told the guy to calm down and go back to his car & family. (I was afraid for a while that hubby was gonna get whacked too). That somewhat restrained him a little but he still continued to rant on for quite some time. His wife, who'd become alarmed by the turn of events, also tried to pacify him and after a long while, he finally stalked back into the car but before he did that, he told Ed "Singapore is very small okay, you watch out!". All this while, his two young kids, who were at the back of his car witnessed the entire scene. Fortunately, Pei Fern had stayed in the car throughout the squabble and had a mobile phone ready so that she could call the police if anything was to happen. Was my first encounter with a road bully..He was truly unreasonable and what amazed me was that he actually carried a metal rod in his car. And he had to be driving a Merc..not that I have anything against Merc drivers but so far, they tend to be an aggressive lot (based on all previous reported cases of road-bullies). I felt sorry for his kids....I hope they don't grow up like him. Photojournalists from TNP and SPH in general are often asked to shoot a wide variety of subjects - sports, fashion, breaking news, entertainment,product shots - regardless of the type of equipment that they have. Most press photogs have a standard set of cameras and lenses which are already breaking their back. How can you bring back publishable shots every day given your constraints? How can you learn from your experiences to bring back a great shot every time? Even if you know your camera inside out, there are many things needed to bring back those great shots, and it doesn't mean having to hide in the bushes for hours like a wildlife photographer or have several assistants like a fashion photographer....photojournalists always need to rush off to the next assignment. The same goes for the busy man on the street, who wants to find out how he can find out the most efficient way to take that winning photograph. Get to know more about the exciting life of press photography, how their tips and tricks can be applied in an everyday situation, understand the quality of light and how to exploit it as well as the art and ethics of people photography, etc. The topics that were covered ranged from the basics of the hows of taking holiday/wedding/baby pictures to fashion photography and capturing scenes of crime and war. The best part of it was that all 4 of the guys were very open and had no qualms about talking about their experiences as photojournalists and their thought processes while taking certain pictures..The segment by Zaihan Yusof was especially entertaining as he revealed how he managed to capture certain underground activities (drug peddling, illegal gambling) with his lenses and how not to get caught!. Before he started his talk, he made sure there weren't any loansharks, pimps and SS pple ard..
Had gotten to work with Ishak due to the New Face photoshoots and he is such a humble & down-to-earth guy, ever so willing to teach what he knows to the newbies . "I had such a difficult time when I started out initially! ", he told me. "All the senior photographers refused to teach me anything and when it was time to take difficult shots, they would send me out to buy coffee or cigarettes!". I was joking with him that with all his awards, he'll definitely get promoted! "No way!" he exclaimed. "Once promoted, you have to sit at the desk and manage the other photographers. I want to be out there in the action, taking pictures, no sitting in the office!" If such a seminar was to come up again, I would definitely recommend it to any avid photographer especially those who wants to be photojournalist. Gotta mention it here too..this seminar was the brainchild of Ian..You can see some of his photos (mainly of his family) at his blog. Interesting fact here - he took his own wedding pictures! But he did say that if he could turn back time, he would probably not do it again. Very siong..he said! 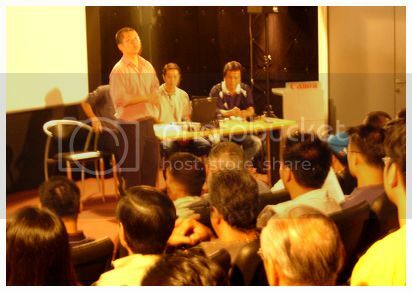 a crappy pic taken at the seminar..That's Ian presenting and with Jonathan (hidden), Zainal and Ishak at the table..
With colleagues, Janice & Georgina and Wei Leng from Canon..
Me & Janice at Billy Bombers before the event..
Just a heads-up here..Janice's book will be launched on the 14th Sept..It's a compilation of her columns about singlehood and relationships with some afterthoughts added. I know she has a quite a number of fans as well as detractors but I do sincerely hope her book will do well. Yes, I did question her choice to pose in Maxims but I still think it is quite remarkable for someone her age to be able to achieve her dreams of having her book published. Wasn't an easy feat. It's not like the book deal just fell on her lap..she had to work for it after many rejections. And from what i know abt her deal, she's not gonna be filthy rich even if the books sells well since most of the dough will go to her publisher..
Janice was commenting that my blog updates have been rather sporadic..Have to admit, I'm less 'inspired' to blog now and more inclined to surf and read other pple's blog when I'm free. I used to tell myself that I'll stop updating my journal when Aidan becomes 'less-cute' since he was the very reason why I started blogging in the first place but I've since stop deceiving myself. I know my entries tend to be somewhat long-winded and most of the time, it can be easily broken down to several different entries but I'm simply too lazy to do so..And i tend to write about mundane stuff especially abt my outings and my family but so what? It isn't thought-provoking or full of substance but what the heck? Why are people going on about blogs having to be of certain quality and calibre? It's great that blogs are more prevalent and anyone can now have one of their own. I think one of the best thing about livejournal is it's user-friendliness and anyone can keep a blog nowadays..be it a new parent wanting to write about her newborne or a student ranting about school life...One always have the choice on whether they want to read someone's blog..Why complain? (but of coz they have a right to do so in their own blog :P). And now there's the issue about the privacy of a blogger. My take is..online blogs are public..If you don't want it to be read, don't let a single soul know of it's address (that may not be exactly fool-proof), lock it up or keep a paper diary instead (though my diary was read by my sister so...). Mine's certainly not very friendly for non-broadband users too..Doesn't help that I upload many pictures each time. Photobucket is my best friend :) I use flickr at times but in spite of many bloggers saying what a great image host site flickr is, I find that it can be rather erratic at times and the pictures don't show up once in a while, so I'll end up with lotsa Xs..anyone else have this problem too? Read somewhere that pictures on photobucket cant be seen by some government orgs & stat boards..True? but maybe some of the more v impt divisions cannot access lah! That merc driver is horribly ridiculous! I mean, who'd carry a rod in his car! With kids present too, what is the world coming to? yeah..i was horrified (and actually getting quite alarmed) when i saw him holding the rod. It wasn't up to me to decide whether to call the police..left the decision to pei fen..in retrospect,we should have eh. Not sure whether she took down the licence plate..
and photobucket's good. i cant seem to get the hang of flickr somehow. 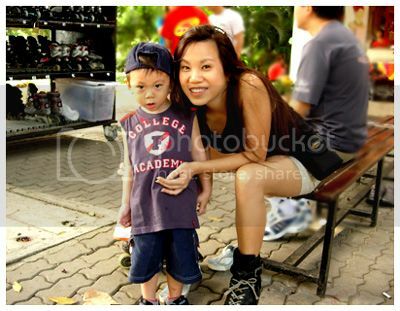 Flickr's quite easy to use and i like their photo album layout..my only gripe is that it is quite erratic..that's all. That seminar on photography sounds really interesting. I wanted to see the photos of the other journalists as well as I'm really into photography as well. 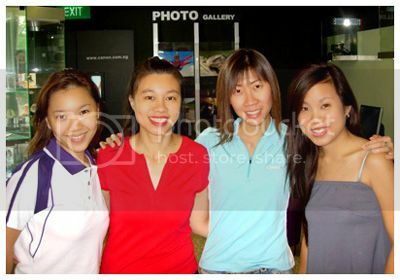 By the way, I like photobucket much better than flickr. Somehow photobucket has a more user friendly platform. It was really interesting to see the actual photos..those that were printed on newspaper tend to be 'less impactful' because the greyness of the paper tend to absorb some of the color..And we also got to see some of the fabulous photos that never got printed..
my heart was beating rather fast whilst reading the merc vs ur fren incident. scary.. imagine my hubby does not mutter things, he will raise hands in a *WTF* manner. It'll prob make people like the merc guy go into rage instantly right? *grasp* So, that bully stays in the same condo too? anyway, wanted to ask you if you can recommend someone to teach me roller blade. I have the entire set since 4 years ago but each time I attempt, I end up being more exhausted trying to get up from falls. No..he doesnt stay in the same condo..this happened at ECP. I think generally, pple do get quite stressed while driving. I did mention before that hubby is also a different person when he's driving..more aggressive and easily aggravated though he'll never confront a person like that..
Hm..have u tried getting a instructor? I saw a few pple being taught at ECP.I don't think there's an easy way to learn how to blade..it's really a no-pain no-gain kinda exercise..inevitable to fall lah. I think it was easier for me coz i learnt how to rollerskate/iceskate at a young age and so blading came easily for me. I guess it's easier to pick up the sport when one's younger and more garang..Tougher later especially when one's less flexible..
i think she was quite affected by it..she was probably more afraid for Ed..but at least nothing serious came out of it. It could have turned out worse. She just smsed me to say that they are making a police report (just for record purposes).. Some pple just have no patience..incidents like this makes one lose faith in people..what a thing to happen at a wedding! 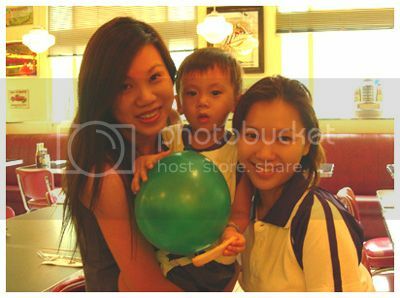 Aidan's shoooo cute in the 1st pic-- so innocent! As for the maniac road bully *shudders*....hope he gets caught by the police! heh..deceptively innocent. He's quite a handful now..
Hmm..i don't think he has crossed the line yet although he did make a verbal threat. At most, he may be issued a warning..
it's a sad thing that mace isn't available in singapore legally, nor is pepper spray. even though its not exactly appropriate, it probably would work to disarm him. urm..personally, i think it's fortunate that stuff like mace and pepper spray arent available in singapore..same for firearms. Pple can use it to protect themselves yes, but it can be used as a weapon too. Now lancerlad is into the mini cornettos. Come home from school, he'll start asking for them. Chia lat. Whoa why so horrible ar? sickening man, these road bullies. Luckily, ur dh manage to calm him and no one was hurt. Must have spoilt ur fren's day. BTW mean to ask Aidan wallop the whole ice cream? She's since reported to the police and i guess we all are glad that nothing 'major' happened..and no one was hurt. 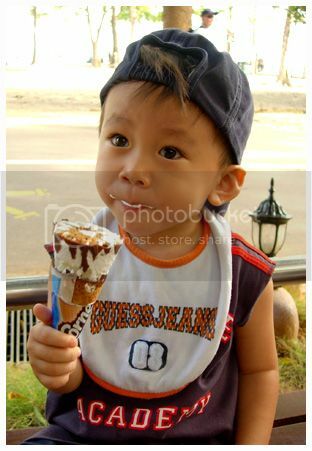 Heh..he shared the icecream with me & Nenita..was too much icecream for him to finish on his own (although he would have if we'd allowed him to). Gosh what a road bully! Thank goodness your hubby is tall and big! heh..i think you are right too coz the guy was quite small built. Actually, Ed is quite tall too so that's 2 big guys we're talking abt too.